2 USB Host, Ethernet, TF card, SPI, IIC, Key. The IPC-SAM9G45 Industrial Computer is a high-performance controller board introduced by CoreWind. It is designed based on the CPU Module CM-SAM9G45 processor card which integrates an AT91SAM9G45 microcontroller, 128MByte DDR2 SDRAM, 256MByte Nand Flash, 4MB Dataflash, 2Kbit EEPROM, UART, Ethernet, USB HOST, LCD, Touch screen, RTC on board. 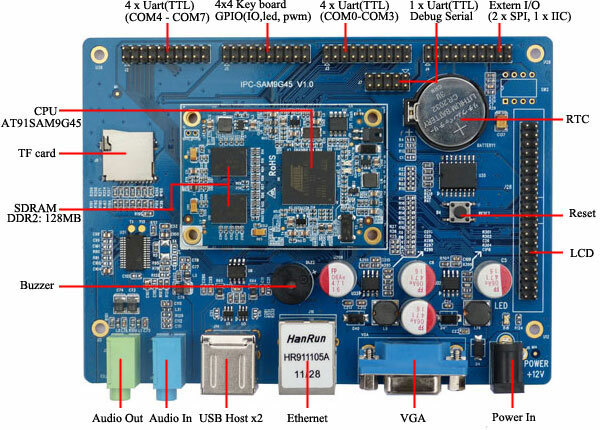 It is connected with IPC-SAM9G45 expansion board through 200pin B-T-B expansion interfaces, The IPC-SAM9G45 expand 5 Serial port from CPU and expand 4 Serial port by System Bus. 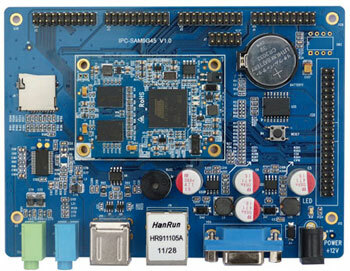 CoreWind also offers customer design service based on the IPC-SAM9G45 board according to customer’s requirement. Whether you need to reduce, add or modify to existing hardware, CoreWind will help customers with expert competence and rich experience.